» Characters from DFW #2: HAPPY McGONIGLE – by Monte Herridge. Characters from DFW #2: HAPPY McGONIGLE – by Monte Herridge. #2. HAPPY McGONIGLE, by Paul Allenby. The Happy McGonigle stories by Paul Allenby was a short series of at least eight stories published in Detective Fiction Weekly from 1940 through 1941. The stories are about the misadventures of petty criminal Happy McGonigle and his partner in crime, Blackie Roberts. Roberts notes that he has trained Happy over a ten year period, and that Happy is handy with burglar tools and in fights, but often makes him sorry he knows him. Blackie explains that he is the brains of the duo, and Happy is the brawn. Trying to plan crimes with help like Happy is difficult. He has to be careful to explain the crime plans very carefully to Happy, who is often not paying close attention. Happy is happiest when he is involved with his latest hobby. He has been through many hobbies, and in the first story in the series, “A Cockeyed Wiggley,” his hobby is collecting matchbook covers. This hobby causes problems with their crime plan for this story, but somehow everything turns out all right, though they don’t make any money from their crime. The next story, “Red, White and Very Blue,” finds the two criminals on their way back from gambling on horse racing at Pimlico, stopping off in Washington, D.C. for some rest and relaxation. Happy turns into a typical tourist, going to see all the sites and spending a lot of money on fancy clothes. They run into trouble when they encounter a group of spies. The spies con the two out of all of their money, and also con them into stealing airplane plans from a house. Fortunately for them, they realize what is going on and hand the plans back to the U.S. Government, and wind up making themselves look like heroes in the process. As shown in the story, Black Roberts can be just about as gullible and naïve as Happy McGonigle. So Blackie’s comments about his partner need to be taken with a grain or two of salt. In the story “In the Bag,” the two are planning a jewel robbery, but another of Happy’s hobbies interferes with the plans. Happy has started taking dancing lessons in order to be an “adagio” dancer. Blackie thinks this is ridiculous and tries to get Happy to work with him on the robbery. But Happy has promised to deliver a suitcase for the dance teacher. The title refers to the fact that three new identical leather suitcases become involved in the plot and the guys try to keep straight which contains what. When the newspaper reports that the dance studio staff has been arrested for drug smuggling, the bag situation gets more complicated. In “Gone With the McGonigle,” Happy’s newest hobby is to become a writer. So he buys a lot of paper, a filing cabinet, a portable table, and a typewriter. After spending all of this money he thinks he is ready to become a writer. However, he finds being a writer is not all it is cracked up to be. Happy finally goes on a destructive rampage through his editor’s house, which he and Blackie are burglarizing. In “McGonigle the Great,” Happy is struck with the wish to be a professional magician. He learns a number of magic tricks while he and Blackie are staying at a large hotel. Unfortunately, he makes so many mistakes that people laugh at his act. Even though the audiences enjoy the mistakes, Happy does not like being laughed at. Blackie notes that Happy is somewhat deficient in a sense of humor. While all of this is going on, Blackie Roberts and a newspaper reporter (who is teaching Happy magic tricks) are searching the hotel for an absconding bank teller who has stolen a hundred thousand dollars. The magic act plus the search make for a situation that is sure to get out of hand quickly. “McGonigle Makes a Bid” finds the duo trying to take a vacation and behave in a law-abiding manner. They head off to the wilds in a car, but wind up stranded at a large house occupied by a crazy man. Unknown to them, the grounds are also the hiding place of three criminals who don’t like the interruption of Happy and Blackie. In “Bombs Tick Once Too Often”, Happy and Blackie are visiting the World’s Fair and trying to enjoy themselves. However, Happy thinks that someone is trying to plant a bomb at the Fair. Their first move is to follow two suspicious acting characters (who are carrying a suitcase) around the Fair. Later, when Happy discovers a bag that is ticking and whirring, he is positive he has found a bomb. Altogether, a very stressful day for Blackie and Happy. “The Skeleton of Danny Force” is atypical of the other stories in the series. Happy McGonigle does not play the primary focus of the story. Blackie Roberts is more the focus of this story, as he and Happy go out to a rural town to help one of Happy’s friends in his dealings with the local Scrooge-like banker. A skeleton is dug up by a local, and this provides the means by which Blackie can counter the banker and get the better of him. The final story, “In Union There Is McGonigle,” The two guys get into union activity, primarily because they think they can make some money in it. Definitely not in it for the benefit of the workers of pretzel salters industry, which is their working area. As usual, they run into numerous complications in the process, and only Blackie’s planning gets them out of the situation and with a profit for a change. Also as usual, it was Happy’s doing that they got into union activity in the first place. He doesn’t appear to ever think through the consequences of his actions. As you no doubt can tell from the above story descriptions, this series is meant to be a light comedy series of stories. No seriousness invades the stories, and the cast bumbles their way along the story lines without any serious damage or landing in jail. The series is not really that funny, however, though it aims to be. It is okay as a mildly humorous look at two bumbling criminals. There were other humorous series in DFW in the past, including two (Fluffy McGoff , 1931-37, and Murray Magimple, 1935-37) by Milo Ray Phelps, who died in 1937. Not having read much of the various humorous series, I can’t say which ones are the best or succeed at being funny. (*) These three were added after the list was first posted. Thanks to Phil Stephensen-Payne for pointing them out as likely possibilities in the comments, and for Walker Martin for confirming that they are indeed McGonigle stories. Previously on this blog: #1. Shamus Maguire by Stanley Day. I think we know now why this only ran to nine entries. Looking at the time period was this meant to be an Abbott and Costello type set up? The illustrator sure seems to have thought so. There were a lot of changes going on with the magazine by the time McGonigle made his last appearance. They changed the size and number of pages in DFW right about then, I think, and eventually it stopped coming out every week. It was probably a good time to end a not-so-funny series that was supposed to be funny and wasn’t. I wonder what the reaction was to these stories by readers in the letter column. Maybe they found some humor in them that’s harder to spot today. Your comparison to Abbott & Costello, David, seems to be right on. Reading through the story summaries again, I can picture the two of them in these situations very very well. I love learning about these pulps here! Time marches on and what readers enjoyed and found funny in 1940, the readers of today vainly try to find the humor. I’ve come across many series that fall flat by today’s standards. For instance, the comedy series starring black characters were once popular in the pulps and slicks. Now very few readers find these tales amusing. Another example is vaudeville. Sometimes I run across some scenes in old movies and I wonder why people paid money to attend and watch such lame and untalented acts. I guess it was just a simpler time with less entertainment available. Once you were finished work what could you do in the evening? Read, listen to radio, movies, vaudeville, sporting events. With such a limited number of things to do, I guess you tended to be less critical. Once just about everybody could afford a car, the entertainment options really opened up. Now with the internet, dvds, and all sorts of time wasters like texting and facebook, we are into a different world. The future will look back on us and wonder why we wasted our time on such activities. Don’t let this stop you Monte. Culture historians need to document these pulp series. Collectors need to know about these obscure series too, how else can we separate the wheat from the chaff. If I didn’t say it the first time, thanks for doing a damn good job. I’m as interested in the bad and mediocre series as the great ones, and it’s nice to have a trustworthy guide through them. I know what you mean about humor I’ve never quite gotten Johnston McCulley’s once wildly popular Thim Tham Thullivan series myself, and not just because it was politically incorrect. And like you I sometimes see old vaudeville and burlesque comic sketches recreated in films and you wonder what they are laughing at. I guess you have to have been there. Keep in mind one of the greatest acts in international vaudeville, playing the great theaters and before royalty, was Le Pétomane, who essentially had a talent for musical flatulence. But then again, looking at some of today’s comedies is that really so far from Jim Carrey? Replying to Curt in his comment above, if you (or anyone else) would like to read some pulp stories without having to spend a single dime, you need go no further than the Online Pulps website, for which Monte is one of the Guiding Hands behind. I believe there are over 1000 stories listed there now, but if not, the selection is still huge. If you’re like me and can’t read fiction from a computer screen, it’s very easy to print off a hardcopy of a story. Most are short and don’t require a lot of paper. I’ve been thoroughly enjoying these articles! “Red, White and Very Blue” sounds like an especially fun story. The cover story by “Bennett Barlay” sounds good too. Isn’t this a pseudonym of Ken Crossen? Mike, you’re quite right about Bennett Barlay being Ken Crossen, who was also M. E. Chaber and Richard Foster and a couple of other guys. SATAN COMES ACROSS was probably a serial when it appeared in DFW, since it was published as a paperback original in 1945 as an Eerie book, in the larger digest-sized format. I wish I could say that I’ve read it, since I’ve had a copy for years, but I’ve just never gotten around to it. 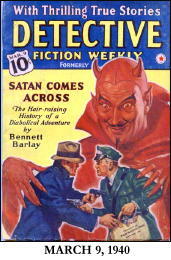 SATAN COMES ACROSS was serialized as a 3 part serial in the March 9, 16, & 23 issues. though I don’t have any of the issues so I could be wrong. Thanks, Phil. The first one has to be a McGonigle story, and I’ll make sure Monte sees your dates for the other two. Hopefully, he or Walker or someone has those issues and we can find out for sure. Well, I’ll eventually find copies of them. They are kind of scarce on Ebay right now. Thanks Phil, for the information. I have my DFW set carefully shelved in chronological order so it was easy to check the three issues listed above. Unfortunately I had to trip and stumble over several stacks of books that I had no place to store, except right in the only path to the DFW’s. If I remember correctly, that is one of the sure signs of bibliomania, having stacks of books and magazines with no place to put them. I know Steve will sanely say, “put them in storage”. But I will insanely reply, “no, I like to have them close at hand so I can trip over them”. But to get back to the important question, yes these three issues of DFW contain the three addition Happy McGonigle stories. The dates and titles of the stories are correct. There used to be a collector/dealer by the name of McGonigle, who attended most of the Pulpcons, 1972-2008. He’s no longer with us but I bet he would get a kick out of this series, though sometimes he was not so happy. Remember McGonigle, Steve? Yes, I do remember Jack McGonigle. I wonder if he ever read any of the DFW stories. I imagine so. He was a dedicated pulp reader through and through. Thanks, Walker. I am afraid my pulps are not quite as well organized as yours, and it takes me some time to find anything in particular. No–Paul Allenby was a pseudonym of my father, Paul Johnston, Sr., who died in 1992. In later life, he wrote and edited for Yank magazine during WWII, then became a financial writer for Barron’s, a PR director for a Chicago-based mutual fund, and then the editor of the Wiesenberger Financial Services mutual fund yearly. He wouldn’t tell me what his pen name was until he was dying, but it was Paul Allenby. This is very interesting about Allenby being a pseudonym of Paul Johnston. I’m sure we all would be interested in why he would not reveal his pen name, even to his son, until the end of his life. Thanks for the information. I certainly wish to know why Paul Johnston, Sr. kept the pseudonym such a big secret. There was nothing wrong with writing for the pulps. I would have liked to write for them.